Funeral services for Dottie Faye Stiles, 84, of Ashland were at 11 a.m. Sunday, Aug. 19 at Coulee-Bethel Baptist Church with Bro. Ronny Moore officiating. Interment followed in Coulee-Bethel Cemetery. Funeral services under the direction of Rockett-Nettles Funeral Home, Coushatta. Mrs. Stiles was born April 7, 1934, in Fairview Alpha and passed away Aug. 16, 2018. Mrs. Stiles was a retired educator for over 20 years. 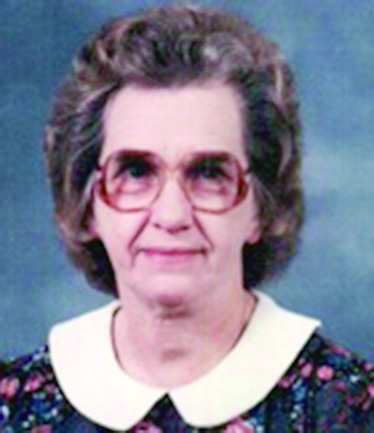 She was a member and song leader of Coulee-Bethel Baptist Church in Campti. She loved the outdoors and she and her late husband, Don, enjoyed their many travels mule and wagon riding cross-country. “Dot” was a good Mom and a good Grandmother and will be dearly missed by all those who knew her. She was preceded in death by her husband, Don W. Stiles; one son, Rickey Stiles; one daughter, Diann Bailey; two brothers, Faxton Dickson and Jerry Dickson; and two sisters-in-law, Jean Dickson and Murl Troquille. Mrs. Stiles is survived by two sons, Wayne Stiles and wife Anita of Ashland and Ben Stiles of Pineville; two daughters, Margie Hoob and husband Troy of Campti and Stacy Finley and husband Rodney of Sheridan, Ark. ; one brother, Felton Dickson and wife Brenda of Shreveport; one sister-in-law, Doris Dickson of Lake Charles; 13 grandchildren; 22 great-grandchildren; and numerous nieces, nephews and friends. Pallbearers were Bernard Head, Mark Head, Clint Stiles, Zach Stiles, Adam Howard, Prentice Stiles, Cody Hart and Joey Blackmon. Honorary pallbearers were Nelson Conlay Jr., Vernon Stiles Jr., Steven Norris, Johnny Bailey and Danny Scallion. The family wishes to express a special thanks to Kindred Home Health, Christus Coushatta Health Care Center staff, Drs. Carter and Cason; and nurse, Haley Roberts.